Radiation Therapy RapidArc®, the next technological advancement in radiation therapy, improves upon both IGRT and IMRT in that it delivers the same precise treatments in a shorter timeframe. This is possible because the technology delivers dose to the whole volume, rather than slice by slice. When a patient receives a typical IMRT treatment, the linear accelerator rotates around the patient stopping several times to deliver the dose. Since these fields are limited to only certain angles, the ability for the radiation to avoid the normal tissue is also limited. When receiving a RapidArc treatment, there are no angles in which the beam stops. The treatment is delivered in one single rotation around the patient. Since there is no limitation to where and when the beam will be on or off, or how fast or slow it is being delivered, the physician now has nearly unlimited choices and degrees of freedom to design an effective treatment plan. This means less side effects and less normal tissue damage for the patient. 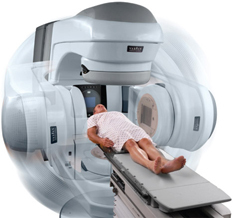 RapidArc treatments are delivered using a linear accelerator with imaging capabilities. The RapidArc imaging capabilities let the clinician see the location of the tumor in three dimensions before treatment. If the cancer has moved due to physical changes, treatment can be adjusted so the patient receives a precise treatment. Like other forms of radiation therapy, RapidArc treatments are planned using sophisticated computer programs that analyze diagnostic image data and calculate the best way of delivering the radiation dose to minimize impact on healthy tissues for each patient while maximizing the dose to the tumor. Immediately prior to treatment, the exact location, size, and shape of the patient's tumor is visually observed through a simple imaging procedure using the linear accelerator's On-Board Imager. The doctor can either take simple x-ray images or an actual CT-scan prior to treatment to ensure the most precise placement of the treatment field. Once completed, the images are reviewed by the doctor and the patient's position can be adjusted so that an accurate treatment can be delivered. The patient does not need to move off the treatment table as all adjustments are made automatically. RapidArc is delivered with a medical linear accelerator, which is a large machine that generates high-powered x-rays and rotates around you as you lie on a treatment couch, delivering the radiation beams from many angles. With RapidArc, the entire daily treatment is completed with a single rotation of the machine. RapidArc is a new approach to delivering image-guided, intensity-modulated radiation therapy (IG-IMRT). Image guidance improves tumor targeting, and IMRT shapes the radiation dose so that it conforms closely to the three-dimensional shape of the tumor. That means more radiation is delivered to the tumor and less to surrounding healthy tissues. The treatments are fast. That makes it easier on you-you don't have to hold still for long, and you're in and out in a matter of minutes each day. With RapidArc, IMRT treatments that typically require at least 15-20 minutes can be completed in a fraction of that time.